The Valley Boys, nine basketball players from Marin, came into San Quentin and beat the Warriors 81-75 in a thrilling game that came down to a blocked shot and last-minute turnovers. 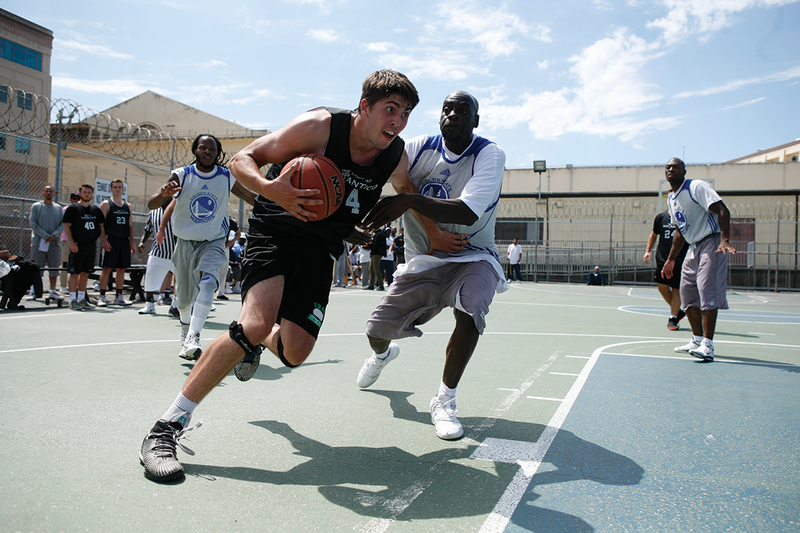 It was the first time the Valley Boys played basketball inside a prison. The team included three former players from the Drake High School team that went to the State finals in 2014. Jasper Verduin organized the team in response to a call-out by Warriors Coach Rafael Cuevas. Jasper’s father, Jacques Verduin, created the Guiding Rage Into Power (GRIP) program, in which Cuevas is involved. GRIP teaches inmates how to control anger. Jasper, who interns for GRIP, played for Drake.He was the No. 2 scorer when Drake went 26-8 before falling to Chaminade in the Division III California Interscholastic Federation State Championship finals. Wearing black jerseys donated by an Italian restaurant called the Loft at Vinantico, the Valley Boys took the court on a clear, sunny July 21 game and took the lead. “They came in with no fear and played their butts off,” Warrior Anthony Ammons said. In the first quarter, Dane Wells, 6-foot-5 Drake alumni, caught a pass under the rim, went up strong and dunked on two Warriors for a 13-7 lead. Wells finished with 14 points, 11 rebounds, and 3 assists. The Warriors came back to within one point at 16-15 when the duck whistle signaled the end of the first quarter. In the second quarter, Warrior Dejon “Dago State” Joy gave his team their biggest lead of the game with an up and under reverse layup to make the score 28-22. Joy finished with 12 points, 13 rebounds, 3 steals, 2 assists and a block. At the end of the second quarter, the Warriors were up 35-34. Both teams circled up at half court to share a few words and pray together. Warrior Tyrrell Price, Sr. talked about his growth over the 10 years of his incarceration. While the teams warmed up for the second half, Eric “Maserati E” Abercrombie played an original song about identity. With the Warriors down two points with 1 minute and 10 seconds left in the game, Veteran Warrior Allan McIntosh, who scored 20 points from off the bench, mostly with his jumper, went up in the face of Chavez. Chavez blocked the shot and recovered the ball. It was his fourth block of the game to go along with 10 rebounds, 2 steals, 2 assists and 23 points. Valley Boy Beau Keeve, who plays for College of Marin, increased the lead 2 more points from behind the free-throw line. Warrior guard Delvon Adams turned the ball over twice in the last 40 seconds. “He played well early; he had a bad two minutes,” Cuevas said. The Warriors fouled to stop the clock. Chavez nailed both free throws, which increased the lead to 81-75.